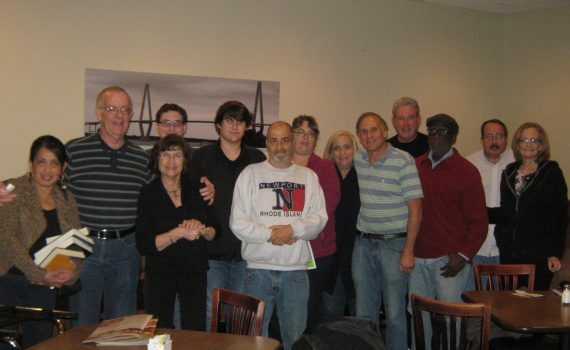 Our meeting on Sunday January 24th was a great sucess! We screened he highly acclaimed film, Shaky Camera, Shaky Tooth: The Abayudaya Experience. This film relates the story of a team of medical volunteers who venture into the remote rain forests of eastern Uganda, offering their services to the Christian and Muslim communities near the town of Mbale. and to a small rural tribe called the Abayudaya. The Abayudaya began practicing Judaism almost 100 years ago, believing for the longest time they were the only Jews left on the planet. Once numbering over 8,000 souls, this community was reduced to less than 300 members during the brutal reign of Idi Amin when Jewish practice was outlawed. Today, the community has revitalized to around 2,000 practicing, observant Jews. As the team gains acceptance into the innermost circles of Abayudaya society, they make subtle use of their lens to reveal the unconventional strategies this community employs to rebuild and maintain peaceful relationships with their once hostile neighbors. This experience challenges the conventional notions of identity, co-existence and acceptance as they relate to Jewish culture in the Diaspora. The Abayudaya refer to a wiggly, primary tooth as a “Shaky Tooth.” “Shaky Camera” is a cinematographic technique which usually employs a single handheld camera to give the film an unrehearsed, documentary feel, while evoking a sense of dynamic immersion. A discussion with Summerville filmmaker, Dr David Abramowitz, followed. We were also honored by having in attendance Dr. Ade A. Ofunniyin, founder of the Gullah Society and Professor of Ethno-Anthopology studies at the College of Charleston. Dr. Ofunniyin shared his insights about Africa and the Lost Tribes.